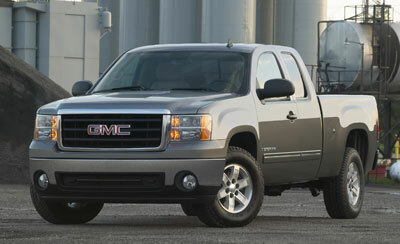 The GMC Sierra is all-new for 2007, redesigned from the ground up. The new Sierra is built on a new platform, stiffer than before for better ride and handling. The exterior styling is all new and a new interior offers the buyer many more options, including a choice of two dashboard styles. The 2007 GMC Sierra will be offered in a Denali version, which makes for a comfortable, luxurious, and highly capable truck. A Sierra Denali can handle business and family affairs as well as perform serious towing and hauling duties. The Sierra Denali offers the same sort of exclusive content as GMC’s upscale Yukon Denali sport utility. Note that until production of the new truck ramps up, GMC dealers will be selling old-style Sierras as 2007 GMC Sierra Classic models. These are not to be confused with the all-new 2007 version. GMC Sierra is available in eight powertrain configurations, five suspensions, three body styles, and a choice of interiors. It comes in standard, extended and crew cab versions. Engine choices include: a 4.8-liter V8, a 5.3-liter V8, and a 6.0-liter V8. The standard cab is designed for fleet buyers and others who want a basic work truck; it’s The standard-cab work truck can be equipped with either a standard bed (6-foot, 6-inch) or a long bed (8-foot). The work truck can be ordered with two bucket seats or a three-person bench seat. The extended cab has two rows of seats with rear-hinged rear access doors that open 170 degrees. The extended cab can be equipped with either a short bed (5-foot, 8-inch), standard or long bed. The extended cab can be equipped with seating for five or six. The crew cab has two rows of seats and four front-hinged doors, like those on a Yukon. The crew cab can be equipped with seating for five or six and comes with the short bed. The Denali comes only as a crew cab and exclusively with a 400-hp 6.2-liter V8 engine with a six-speed automatic transmission and all-wheel drive. Standard equipment on the work truck ($17,860) includes an AM/FM radio, daytime running lights, tire pressure monitoring system, smooth ride suspension, 17-inch wheels, chrome bumpers, air conditioning, vinyl seating surfaces and one-year of OnStar. The SLE ($24,050) adds a CD player, cruise control, cloth seats, a rear-window defogger, auto-dimming rearview mirror with compass and outside temperatures, leather-wrapped steering wheel, fog lamps, handling/trailering suspension, carpeting and power door locks/windows/mirrors, while the SLE2 ($28,695) adds dual-zone air conditioning, a floor console, six-way power driver and front passenger seats, audio controls on the steering wheel, premium cloth seats and machined aluminum wheels. The SLT ($30,855) adds a six-disc CD changer with Bose sound system, leather seat trim, heated windshield washers, front bucket seats with 12-way power adjustment and polished aluminum wheels. Options include head curtain airbags ($395), XM satellite radio ($199), a locking rear differential ($325), Stabilitrak ($425), and a power sunroof ($685). Safety features include the mandated dual front airbags and a tire-pressure monitoring system. Optional head curtain airbags automatically inflate when sensors sense a severe impact to provide extra protection in the event of a rollover or secondary collision. Also available: driver and front-seat passenger side-impact air bags; anti-lock brakes, StabiliTrak electronic stability control with rollover mitigation technology, Autotrack active transfer case, ultrasonic rear park assist, OnStar emergency notification. The design of the front end of the 2007 GMC Sierra emphasizes the truck's wide stance. The GMC emblem is set amid dark horizontal bars in the middle of an upright and chrome-surrounded grille. The headlamps are a pair of stacked, jeweled lenses. The front bumper features round fog lamps and a wide air intake and wraps around the sides of the truck to the front lower edge of the front wheel wells. The Denali gets it own chromed grilles, both the upper section and the air vent below the front bumper. The hood has a pair of long, narrow V-shaped power bulges and leads back to a steeply raked windshield. The windshield is tilted back for improved aerodynamics and enhanced highway fuel economy. Nine colors are available on a truck that looks taller and stronger than its predecessor, yet also has improved aerodynamics that help give the Sierra a highway fuel economy rating of as many as 22 miles per gallon with the 5.3-liter V8 engine under the hood. An optional cargo management system is available for the bed with side rails and various cargo-carrying and cargo-controlling boxes and dividers and tie-downs. The GMC Sierra and Chevy Silverado are built on the GMT900 platform, which shares most underpinnings with the Yukon SUV. The pickups get a unique rear frame section that is 245 percent stiffer. The Sierra and Silverado share mechanical components, with the exception of the unique features found on the Sierra Denali. Compared with the previous-generation GMT800 truck, the new frame is 234 percent stiffer in torsion rigidity, 62 percent more resistant to bending and 136 percent stiffer laterally. This yields a smoother ride and better handling. It also allowed the engineers to reduce the gap between the truck bed and passenger compartment as well as the gaps between fenders and bumpers, all of which enhances aerodynamics and fuel efficiency. For 2007, the front suspension has switched from torsion bars to coil-over shock absorbers and the rack-and-pinion steering gear is mounted to the engine cross member frame. The truck also has a new rear axle design with shocks absorbers mounted outboard and more upright for better dynamic control. The 2007 GMC Sierra boasts interior features popularized by the Yukon sport utility, providing a much more upscale environment for the driver and passengers. GMC hasn't forgotten about owners who use their trucks for work, however. So the Sierra is available with the choice of a pure pickup interior or luxury-inspired accommodations more in the style of the Yukon. The “pure pickup,” as it's called, has a unique dashboard that is more driver-oriented and has larger switchgear and door handles that are designed to be easily manipulated by those wearing work gloves. The pure pickup dashboard has a double-decked glove box system, with the upper box just large enough to hold a pair of work gloves and a few smaller items. The pure pickup interior includes a 40/20/40 split front bench seat with the center section folding down to provide a large storage compartment and wide armrest. The SUV-style luxury-oriented interior puts audio and ventilation system controls more easily within reach of the front-seat passenger and has two front bucket seats with a fixed center console with assorted storage compartments. GMC says the interior of the new Sierra is 20 percent quieter than its predecessor, thanks to enhanced insulation materials, much like those used in the company's sport utility vehicles, and to aerodynamic improvements that reduce wind noise. Rear seating is provided for three people in the extended and crew cab versions, with a comfortable 34.3 inches of rear legroom in the extended cab and 38.7 in the crew cab. Access to the rear seating area of the extended cab is eased by rear-hinged doors that open to nearly flush with the rear quarterpanels. Sitting in the back seat of the extended cab is made more pleasant thanks to the fact that the windows in the rear access doors power fully down. We've driven three versions of the 2007 GMC Sierra near Scottsdale, Arizona. We found all of them to be comfortable. The 5.3-liter V8 provided plenty of power for the extended cab SLE models we drove and the 6.0-liter V8 was more than enough for the SLT Crew Cab. Of the suspensions, the Z83 offers the smoothest ride while the Z85 is slightly stiffer and for those who often tow trailers. The Z71 is set up to enhance off-pavement driving. The Z60 configuration is for what GMC calls “maximum street performance” and includes big 20-inch wheels. The NHT geometry is designed for Sierra owners who need to tow heavier trailers. The SLT Crew Cab 4×2 we drove was equipped with the Vortec Max 6.0-liter V8 engine, and a 3.75 rear axle. It was fitted with Stabilitrak, side-curtain airbags, a locking rear differential, and a convenience package that includes adjustable pedals, remote vehicle starting system and rear park assist. The SLT we drove had the NHT suspension designed for maximum capacity trailering, with a special steering gear, shock absorbers, rear axle and tires. The suspension was comfortable and did a good job of isolating the bangs and bumps as we motored along gravel roads, with lots of good-sized rocks, through the Arizona desert north of Phoenix. But the truck also was comfortable and fully capable of being driven fairly aggressively on narrow paved roads that twisted up the Yarnell Grade and on through the mountains as we took the scenic back way into Prescott. One of the trucks we drove had its bed loaded with heavy cargo and the brakes were good enough that nothing dramatic happened when we had to make a hard and fast stop. The GMC Sierra is all-new for the 2007 model year. It features new exterior styling and new interiors that can be ordered for pure pickup work or for more luxurious family-oriented duties. Those who plan to use their trucks for commuting to work, carrying lots of family members and towing boats, may prefer the SUV-style interior, but pickup truck veterans who use their trucks for work likely will opt for the more driver-oriented pure pickup design. NewCarTestDrive.com correspondent Larry Edsall test drove GMC Sierras on the desert roads north of Phoenix. Head/hip/leg room, f: 41.2/62.5/41.2 in. Head/hip/leg room, r: 40.5/65.4/38.7 in.